In July this year I had the opportunity to attend the Recreating the Medieval Palette workshop taught by Cheryl Porter in the picturesque town of Montefiascone, Italy. The five-day workshop consisted of lectures during the morning, followed by practical sessions of paint and ink making in the afternoon. The workshop allowed the members of the group to gain a deeper understanding of the history, chemistry and use of pigments that were produced during the medieval era, with a focus on European and Islamic manuscript art. Left: Cheryl Porter lecturing. Right: A view of Lake Bolsena from outside the classroom. During the workshop we studied two groups of pigments; organics such as indigo and madder, and inorganics such as gold and lapis lazuli. Inorganic pigments are further separated into natural or synthetic. Some synthetic pigments include vermillion, lead white, red lead and lead tin yellow. We also had the opportunity to study inks including iron gall ink and carbon ink. Left: Participants preparing the wonderful blue pigment lapis lazuli. Right: Experimenting with different inks, using a quill of course! To create a colour for painting, the chosen ground pigment was firstly mixed with a small amount of water using circular motions in the shape of a figure-of-eight, to create a thick paste. At this stage the pigments were ground to the required particle size; some pigments need to be finely ground while others lose their colour if they are ground too much. 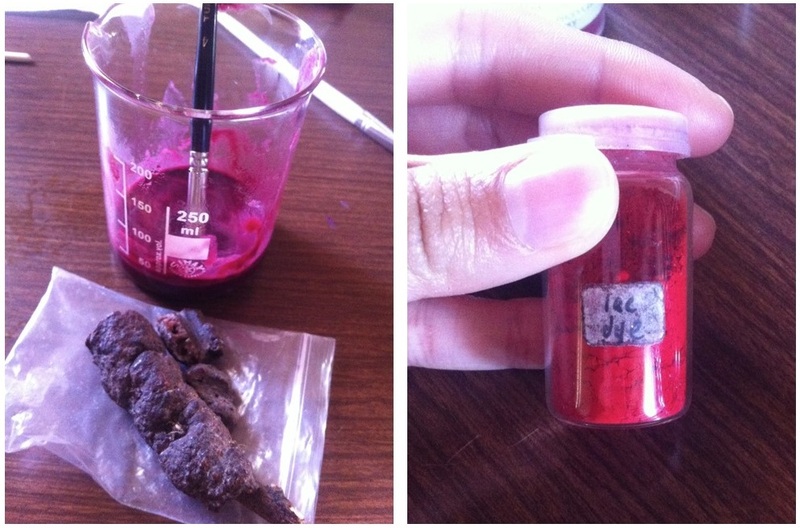 Following this, a binding agent was added to the paste, to bind the pigment particles together and to help the pigment stick to the painting surface. In the workshop we tested a variety of different binding agents including egg white, egg yolk, and tree gums. Left: mixing egg yolk with Vermillion to produce a beautiful red colour. Right: the binding agent Gum Arabic. For the medieval artist, understanding materials was a huge part of their knowledge and learning; they needed to know where to buy materials, how to make paint, how to apply their paints to specific supports such as plastered walls or parchment, and learn the skills necessary to determine their quality. For conservators it is useful to have an understanding of pigments and their chemistry to be able to make informed decisions when treating pigmented works of art. I found it particularly useful to learn about the binding agents used in pigments. At the Chester Beatty Library I have been conserving a collection of Indian miniature paintings, which have particular problems with the lead white pigment flaking. Lead white was one of the most important pigments in the history of painting as it has wonderful density and whiteness; it was the best pigment for creating highlights. Chalk and bone were other options for white but they were often used as mixers only and their opacity was nowhere near as good as that of lead white. Left: Experiments using lead white. Centre: Adding water to ground malachite before the binding agent. Right: Grinding prepared pigment using a muller. During the workshop I had the chance to prepare lead white and immediately I could see some of the difficulties in working with it. Firstly, most pigments are mixed with a small amount of water to create a smooth consistency before adding the chosen binder. However, as lead white is insoluble in water, this proved to be rather challenging- mixing it with a binding agent was more successful in creating a thick paste. Due to the density of the lead white pigment, large amounts of gum were added to create a smooth texture to paint with. The heavy lead and the large amount of gum Arabic binder added to the pigment often result in the flaking of lead white pigments on manuscripts. A new awareness of the historical and chemical problems with lead white has informed my understanding of the manuscripts I have been treating at the CBL. I now understand that many other pigments used in manuscripts were likely to have been mixed with lead white to create lighter colours, one of the reasons there are often problems with other colours flaking. Top: Seed Lac. Bottom: Stick lac. Learning more about insect colours was really interesting for me too (I am fascinated with bugs). One example is red lac, which is an organic pigment made from a secretion of the Kerria lacca or Coccus lacca insects that live on the ficus tree and are native to India and South-East Asia. The word lac comes from the Sanskrit word meaning 100,000 due to the number of insects that live together. 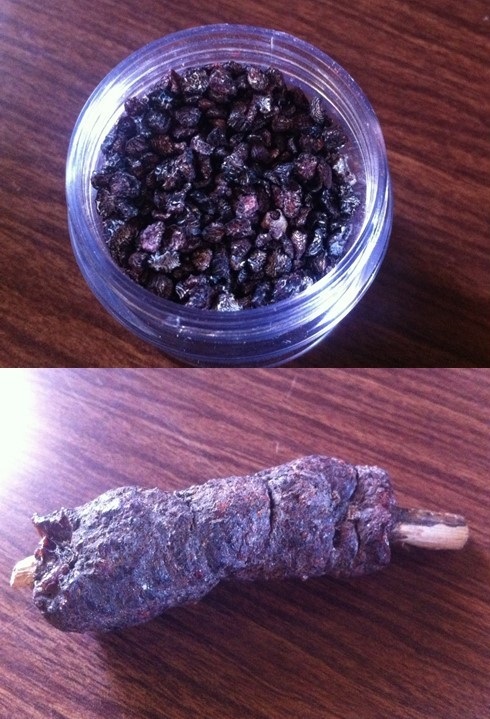 The insects secrete a waxy resin which can be harvested from the branches of the tree. This is referred to as stick lac. Lac was an expensive dye used in ancient India, China and Syria, and then used in Western Europe by the Romans. It was often used as a lake and recipes are found extensively in the 14th century. The same material was also used for shellac and varnishes. Conservators must consider several factors when dealing with lac in manuscripts; the colour is very sensitive to pH as well as moisture. Additionally the red lac colour reacts to changes in temperature. Unfortunately, very few organic colour keep their brightness as they tend to fade; also, they could only be used in season. Artists solved some of these problems by making clothlets. The process involved squashing the insects or plants until a juice was produced and then soaking up as much colour as possible with small pieces of cloth that were dipped into the extract. The cloth was left to dry and the process was repeated many times to get a saturated colour. When ready to use, a small piece can be cut off the clothlet and soaked in warm gum, which bleeds out the colour. Clothlets were fine for the manuscript painter’s needs, however they were not so good for an easel painter or someone who needed more bulk or covering power. By the 14th century there was a technological leap and the most common way to preserve colours was to create a powder pigment from the colour juice or dye, which is called an organic lake pigment. The juice produced from the plant or insect could be poured onto chalk and then stored as a powder. Left: Preparing a lac lake. Right: a small bottle of lac lake pigment. The opportunity to attend this workshop in a beautiful part of Italy has been a fantastic learning experience for me. I was able to develop my knowledge of pigments to a much higher level and Cheryl’s lectures and instructions for making pigments and inks were not only informative but also a great deal of fun. As a variety of professionals attended the course including artists, conservators, students and historians, I felt I was able to exchange knowledge with other participants and learn more about the way in which this workshop was going to aid their work. By the end of the week, I had created samples on Islamic paper, European cotton paper and sheep parchment, which I will use as a reference guide when looking at pigments in manuscripts in the future. I would like to thank the Zibby Garnett Travel Fellowship and the York Foundation for Conservation and Craftsmanship for generously providing funding to attend this workshop.